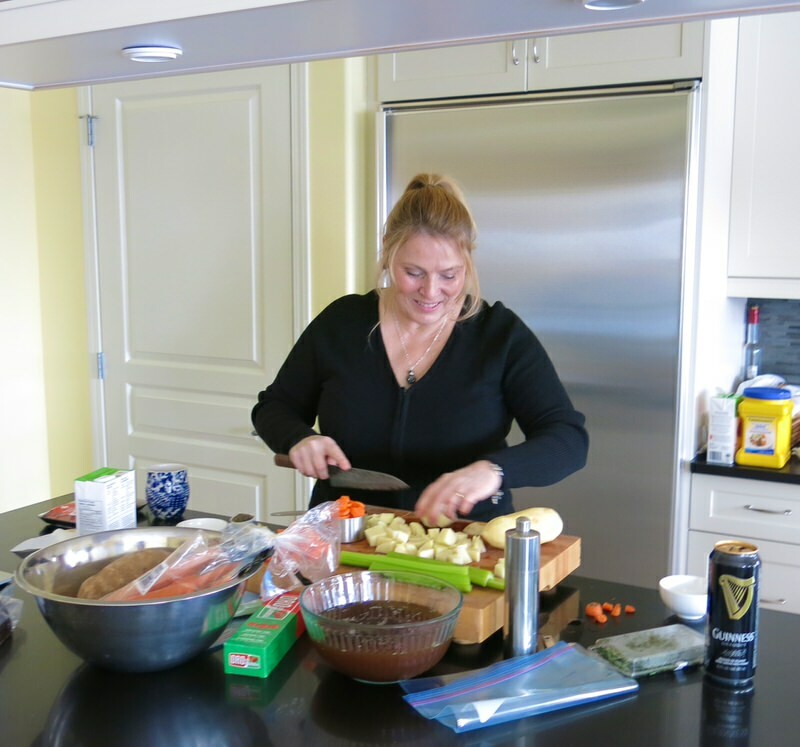 Canadian Irish Stew and a bit o’ Blarney in the Kitchen with Laureen! Irish Stew! Top o’ the mornin’ to ya! What better than this great big pot of jewel-toned comfort and love for your family to celebrate St. Patrick’s Day on Friday this year! Many of my readers likely already know Laureen. Meeting a like-minded local gal is always a thrill. For me, that means meeting a gal who loves to cook! Laureen and I met 3 years ago in Vancouver at the second Food Bloggers of Canada conference. Imagine. We live so close to one another, but it took us flying to our sister province for a conference before we met. I knew of her long before we met. I was a fan of her site, Art and the Kitchen, with her pretty pictures of the delicious food she made. Laureen started her site in 2012, so I am amazed at the overwhelming body of work created over such a few years. 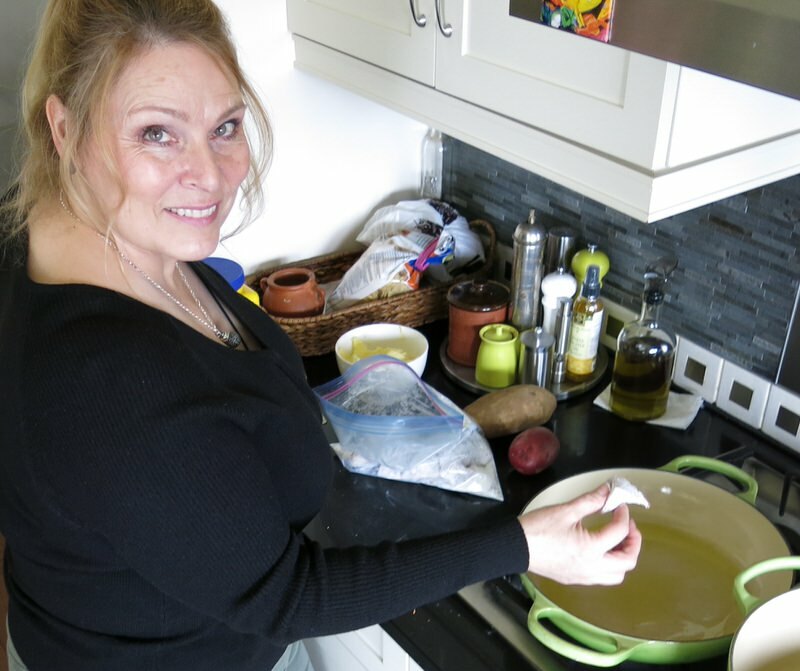 Her son, Garrett moved to Calgary to attend University in 2012 and suggested she start a blog to share her favourite recipes so he could cook away from home. Apparently, he has become a pretty good cook due to his mom’s hobby that has now grown into a pretty substantial at-home business. 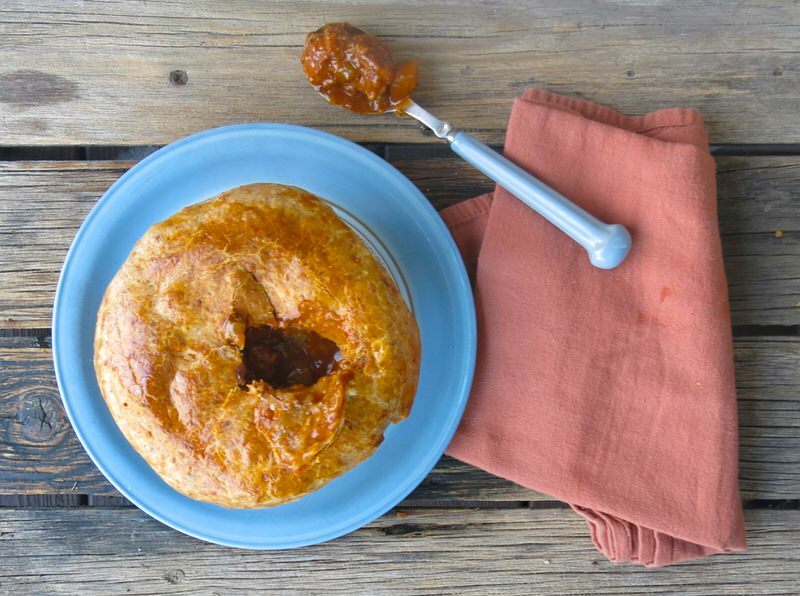 Her most famous recipe is her pumpkin pie that is the number one holiday pie on pinterest. 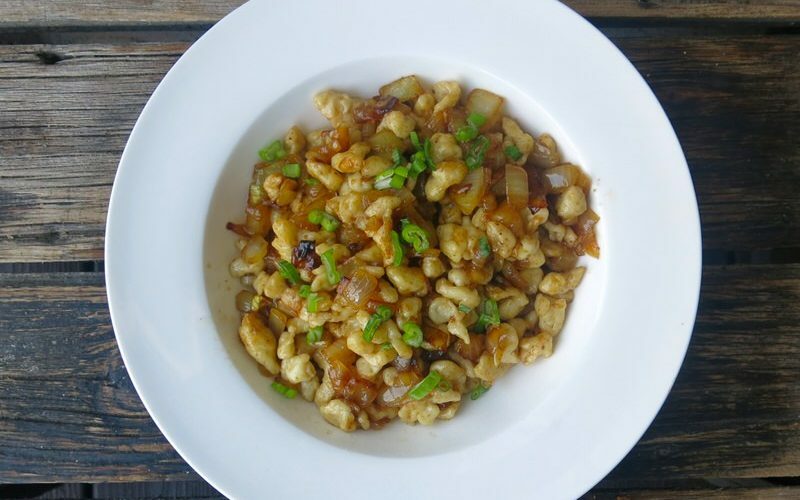 A really delicious recipe that Laureen’s family loves and she makes often that doesn’t get as much traffic is her Chicken Dumplings. Take a look! 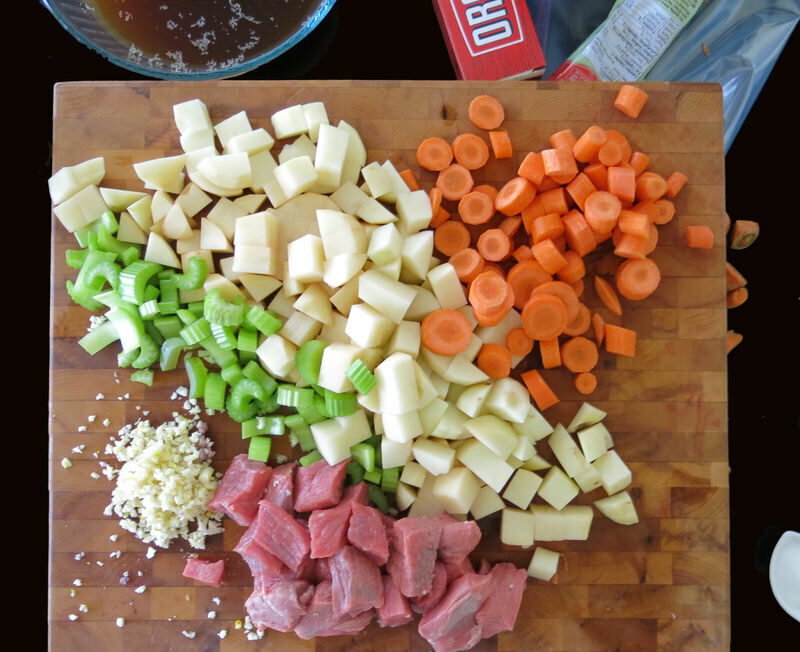 A couple of years ago, my daughters, Lauren and Ragan made my Irish Stew Recipe for their Dueling Daughter’s Project. 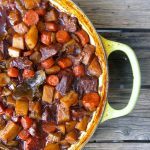 It is not as traditional, and is more of a “stew-stew” than an Irish Stew, but I think most rich stews could easily be considered “Irish-like” by the Irish. It was incredibly delicious, yet markedly different than this one, particularly with the little sparkle of the Gremolata-type garnish on top. Only in Canada, I say! 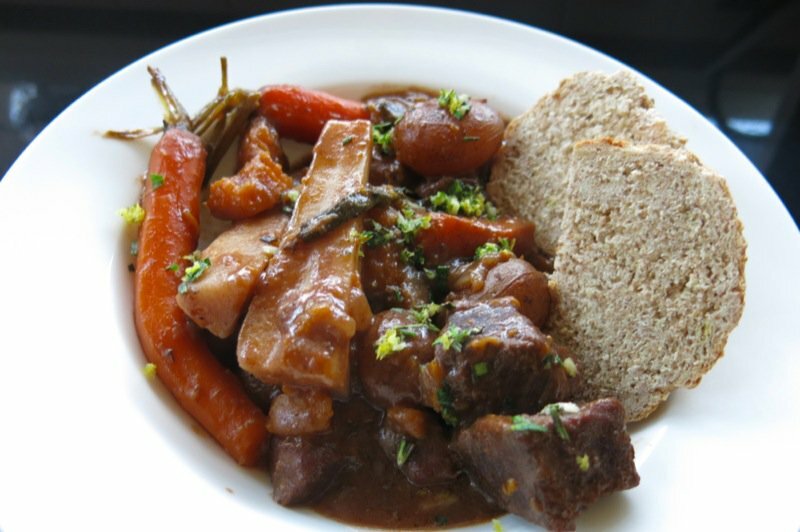 Still, the Irish are famous for the Irish Stew. Why? Must be delicious? It is any variety of meat-and-root vegetables native to Ireland. 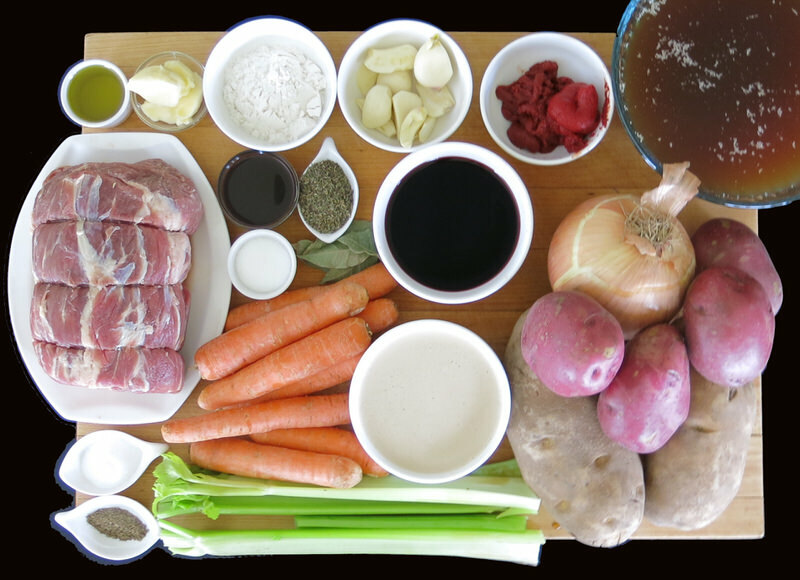 Every version differs from family to family, but the common ingredients traditionally include lamb, mutton or kid (baby goat), potatoes, onion and parsley. 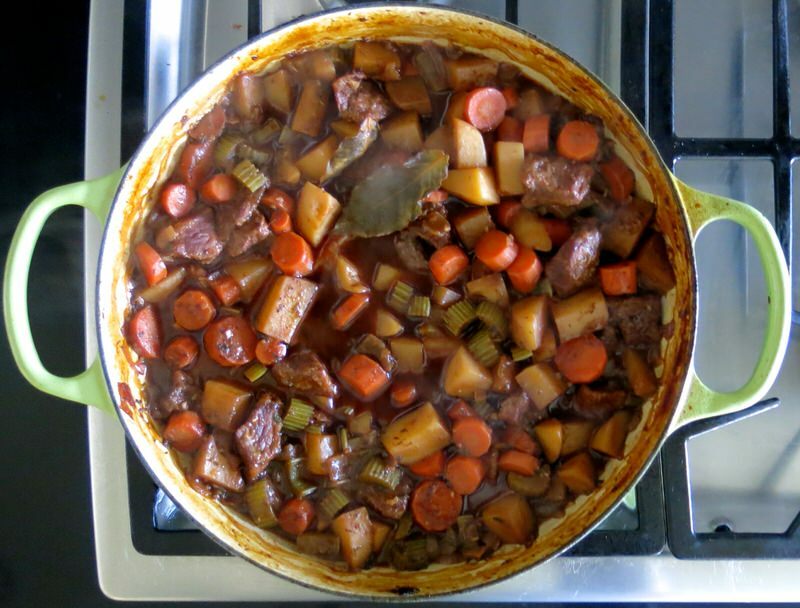 “Purists maintain that the only acceptable and traditional ingredients are neck mutton chops or kid, potatoes, onions, and water” yet others add “carrots, turnips, and pearl barley” (Wikipedia). The economic importance of sheep from the famous Irish wool and fabulous Irish cheese making ensured that old sheep ended up in a stew where they needed hours of cooking due to their age. This culinary tradition relied on cooking over an open fire and recipes have been recorded as early as 1800. Of course, the over the fire cooking was much earlier than that. After the idea of the cauldron was imported from Europe by the Celts, and cooking in a cauldron over an open fire became the dominant cooking method in ancient Ireland, preferred over cooking on a spit because even poor families were then able to survive on a stew. “Food historians believe that goat was originally the meat of choice, eventually being supplanted by beef and mutton.” (Wikipedia) Root vegetables were then also added, with the exception of the revered potato as it wasn’t introduced to Ireland until after the 16th century. 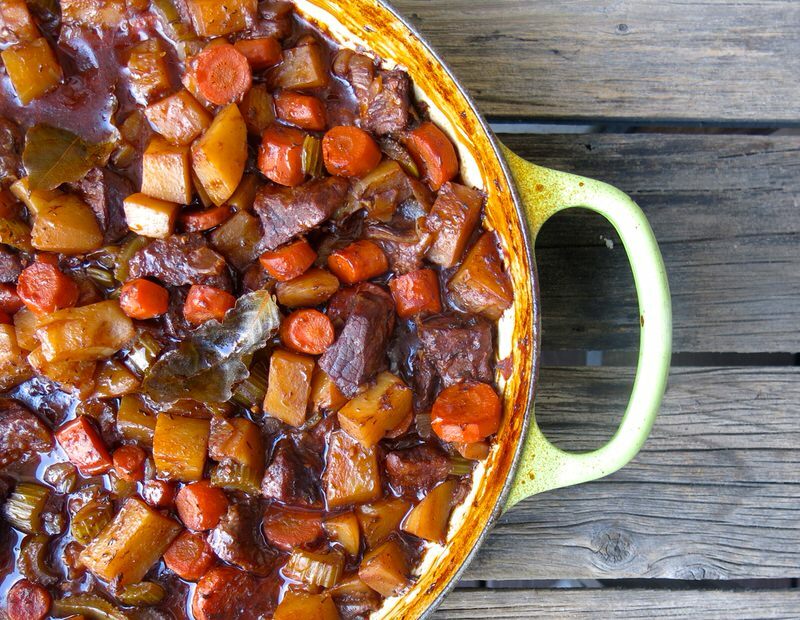 Modern Irish Stews are made with beef and Guinness. 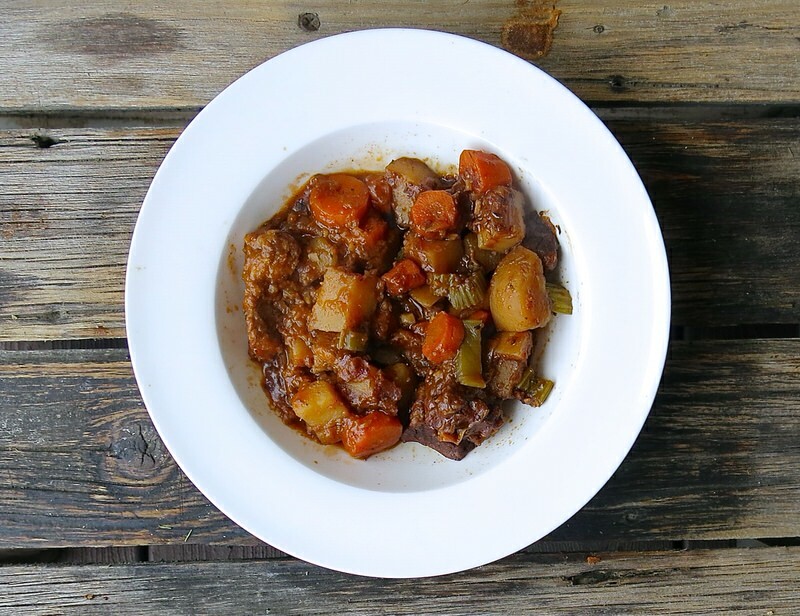 The ancient tradition of stewing is still carried out and revered in modern Irish homes and remains one of Ireland’s best-loved dishes with both the traditional lamb version and the modern beef and Guinness version also sold and served in local pubs. 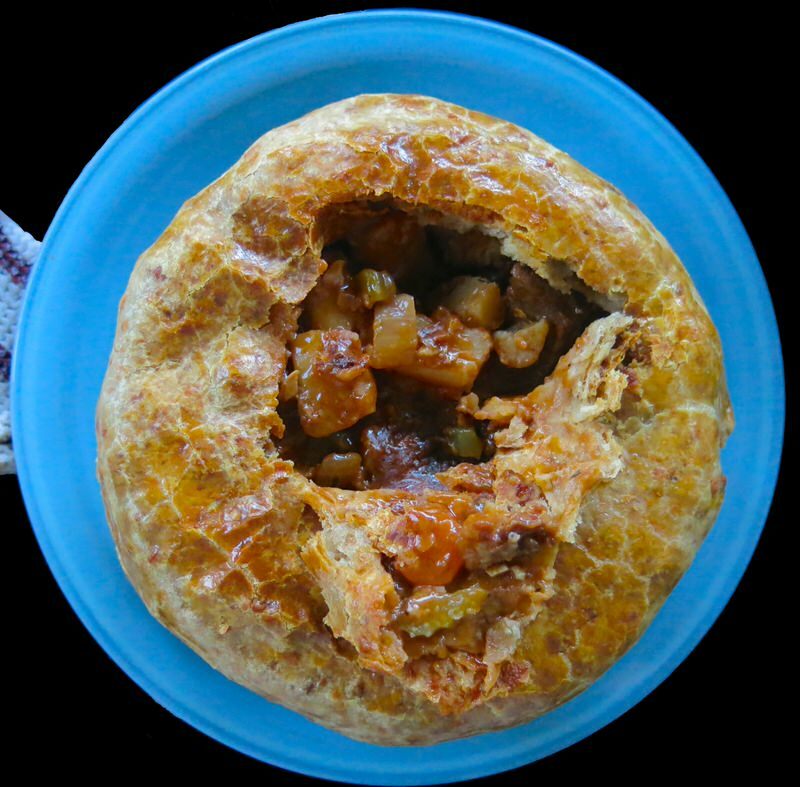 Laureen arrived surprising me with an idea to lay a pastry crust over individual servings of the stew for serving, once made. She had found some Guinness Cheddar and brought here recipe for Cheddar Stout Crust. Without question, we added that to our chore list. What an incredible idea. 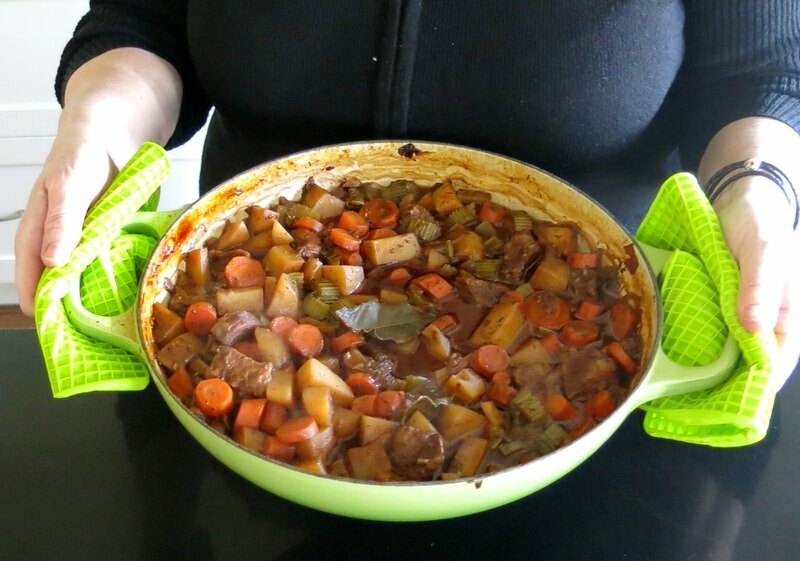 Laureen’s Cheddar Stout Crust dressed up the simple, modest and very homey Irish Stew to enable its presentation at even the fanciest of dinner parties. And it was delicious, as well. 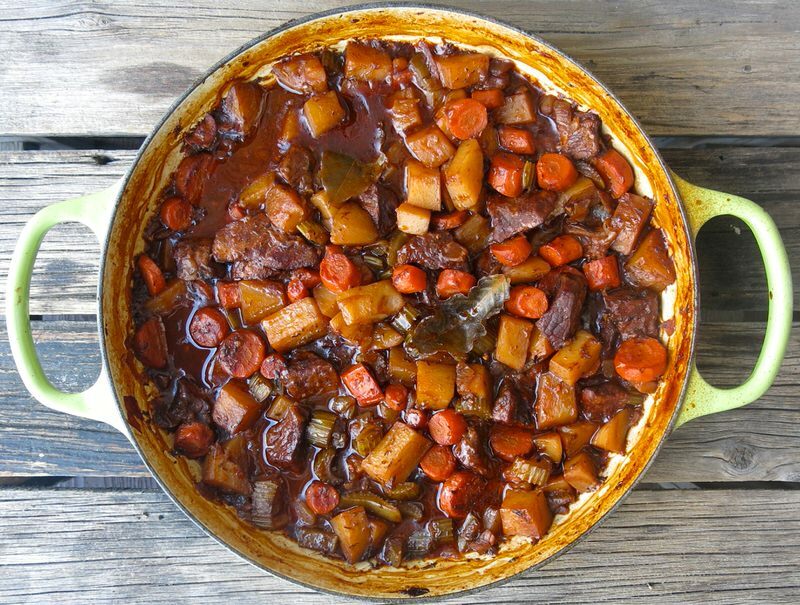 There are as many delicious homemade Irish Stews as there are really great Irish home cooks. Every one will be different. Even ours were different and we followed the exact same recipe and worked side by side doing exactly the same thing. More on that, later. 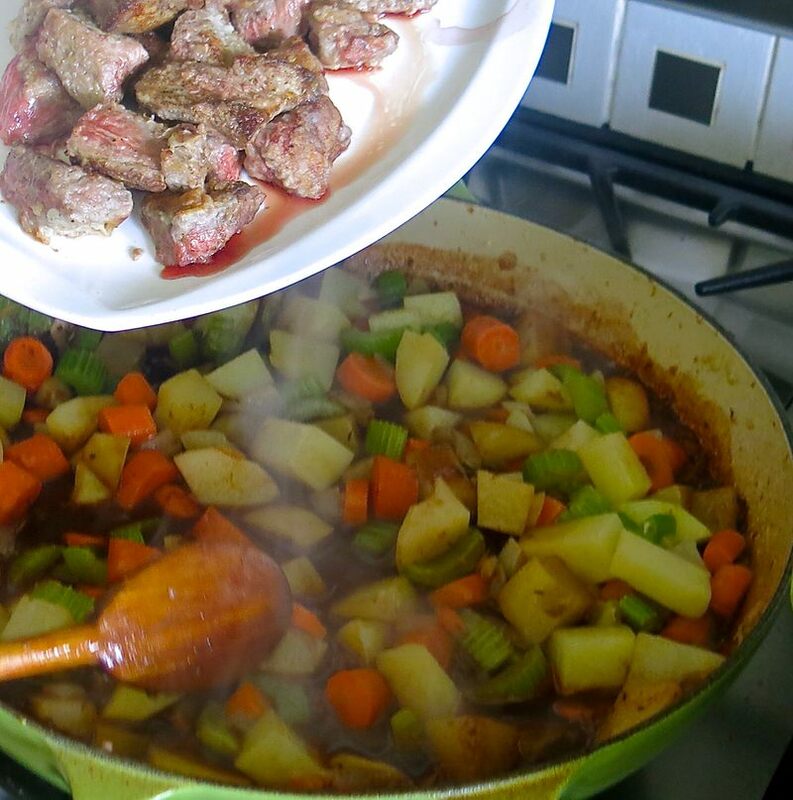 The point is, the foundation is always the same: beef or lamb stewed with onions, potatoes and root vegetables. 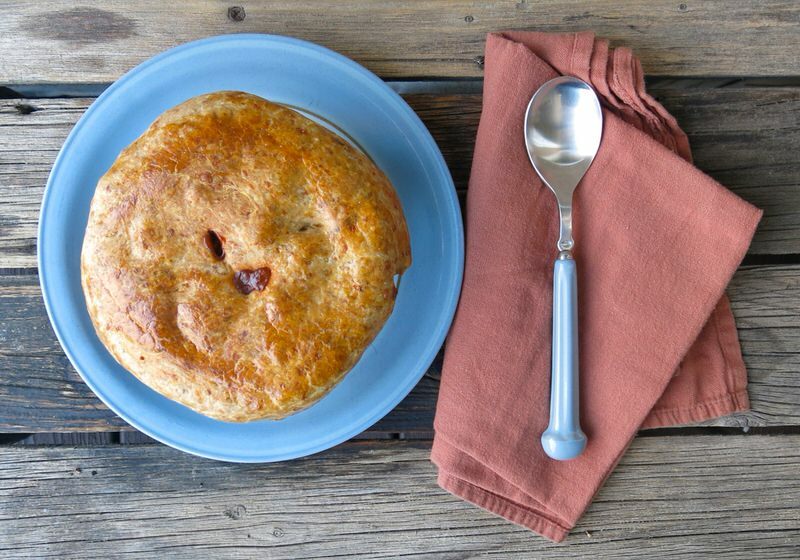 The addition of Guinness, red wine, a pastry …. there isn’t a home anywhere who doesn’t do what they know to do better. 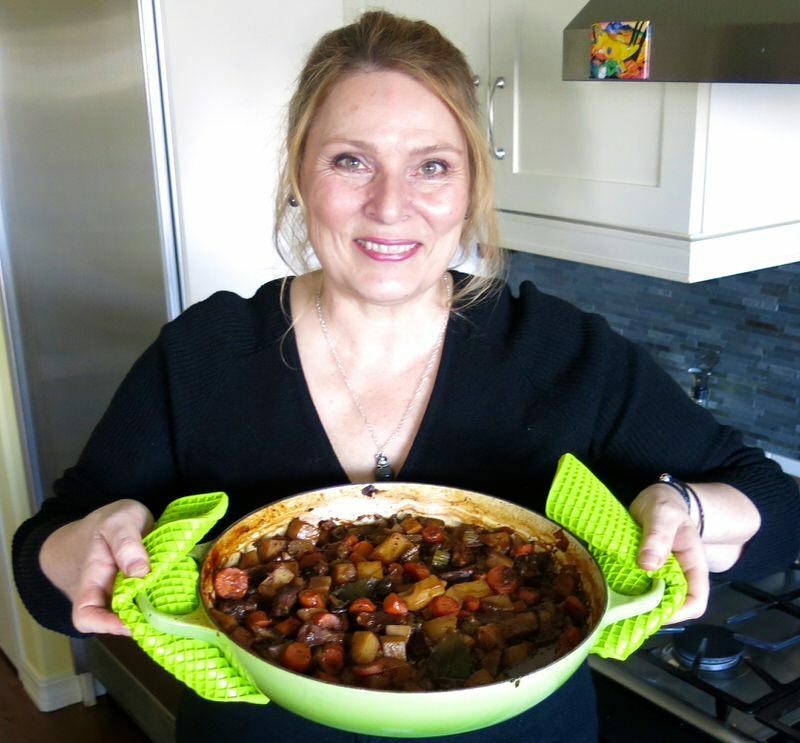 Canadian Irish Stew: Cooking in the Kitchen with… YOU! 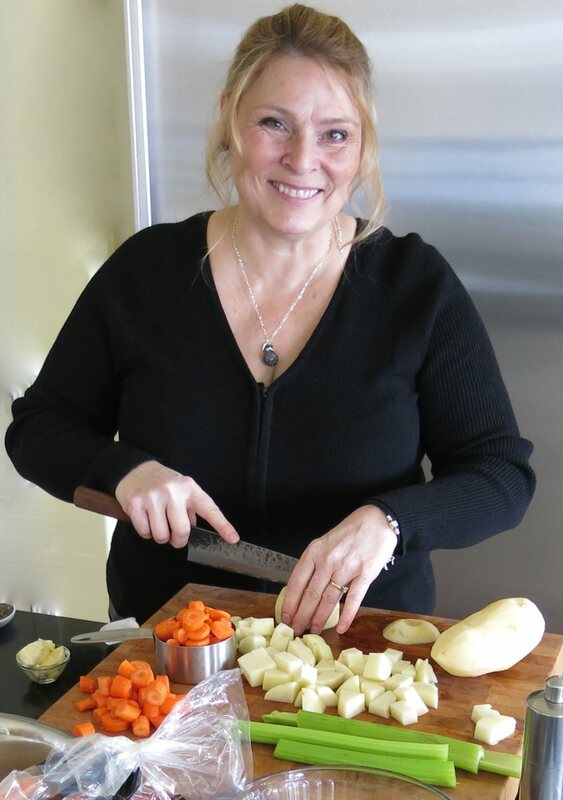 Laureen is officially the first gal in my new Project 2017: Cooking in the Kitchen with…. you! I am so delighted that she agreed to participate! Hope on over to the link to read all about the project then let me know you are interested in participating! 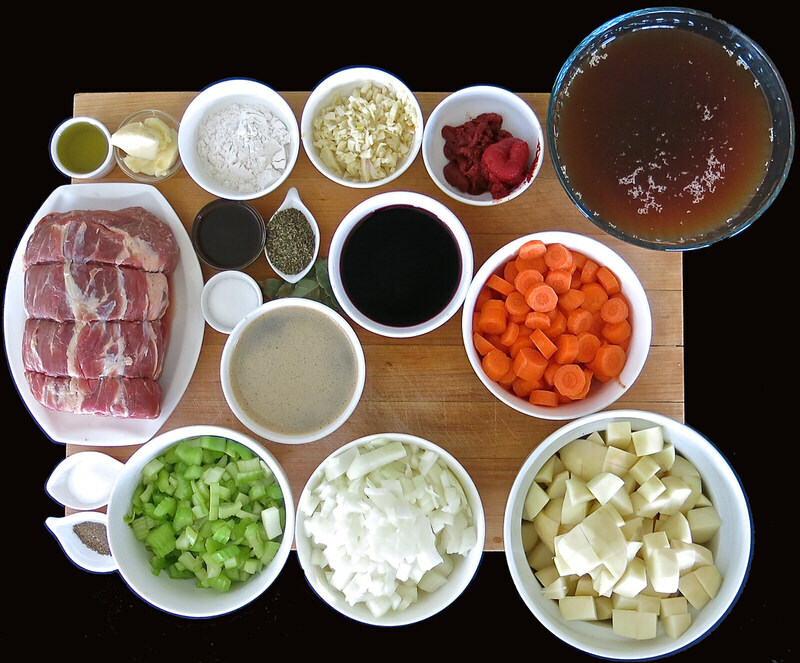 Above, the mis en place before chopping and slicing and dicing. 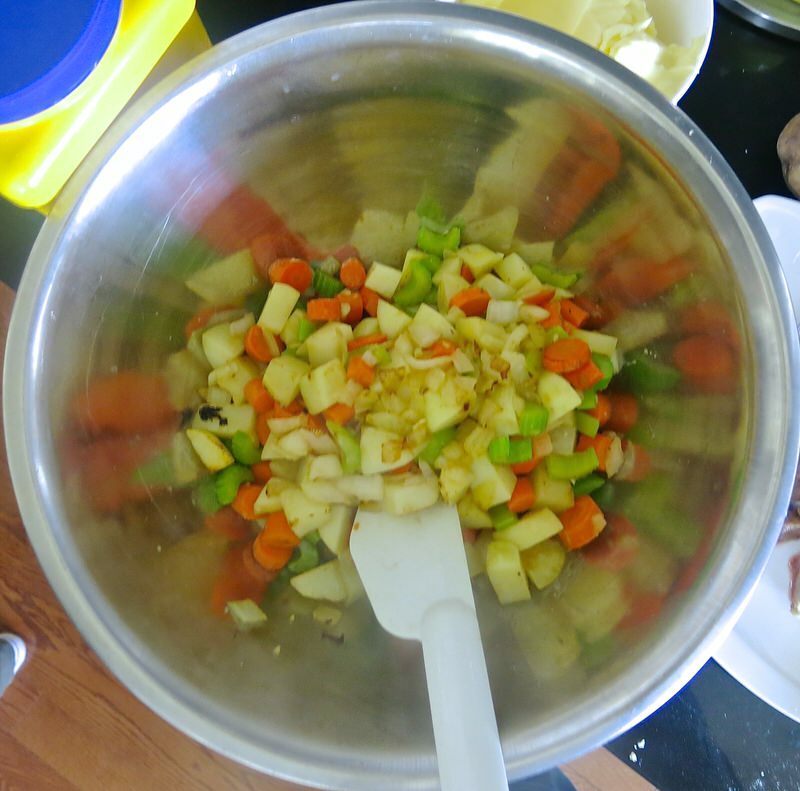 Below, the mis en place after chopping and slicing and dicing. 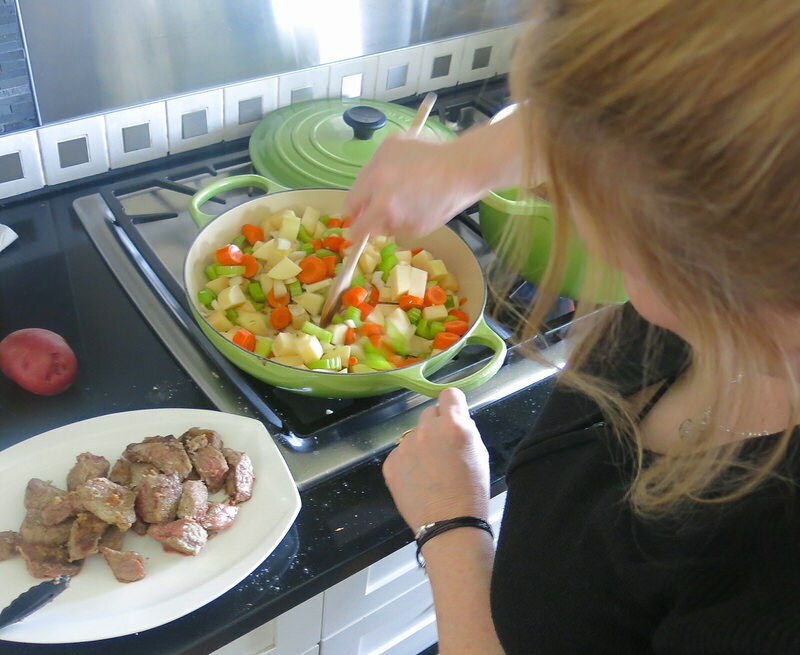 Laureen worked at one end of the Kitchen Island, and I at the other; below, her chopping and slicing and dicing. We should frame it, no? There is nothing prettier than colourful vegetables all prepped and purdy! If only I could look this good working in my kitchen! 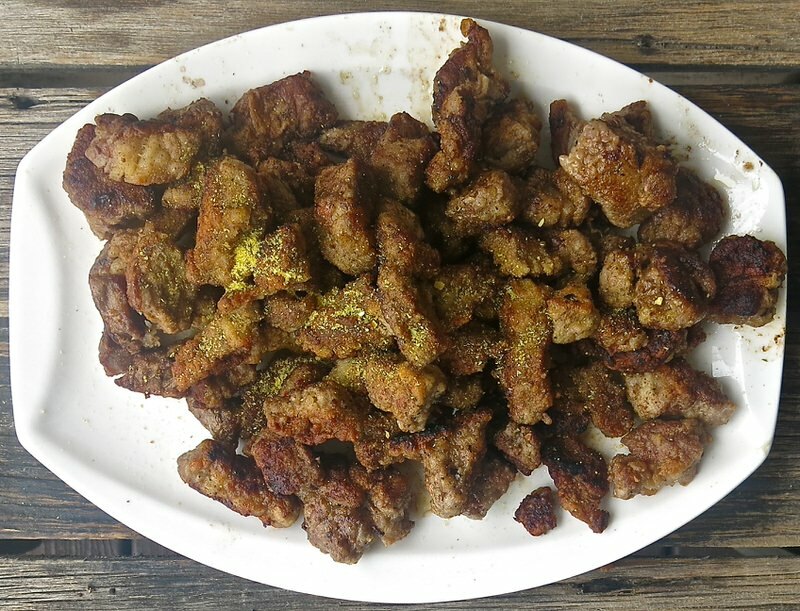 Above, you will see the beef cubes in a bag of seasoned flour. Laureen is placing them carefully into the pot with sizzling hot oil ready to brown their little batooski’s off. Looking good so far. The aroma in the kitchen was starting to tantalize. Browned beef removed, vegetables go all in. Now this is the first time I have ever (in my long and laboured life) browned potatoes for a stew. 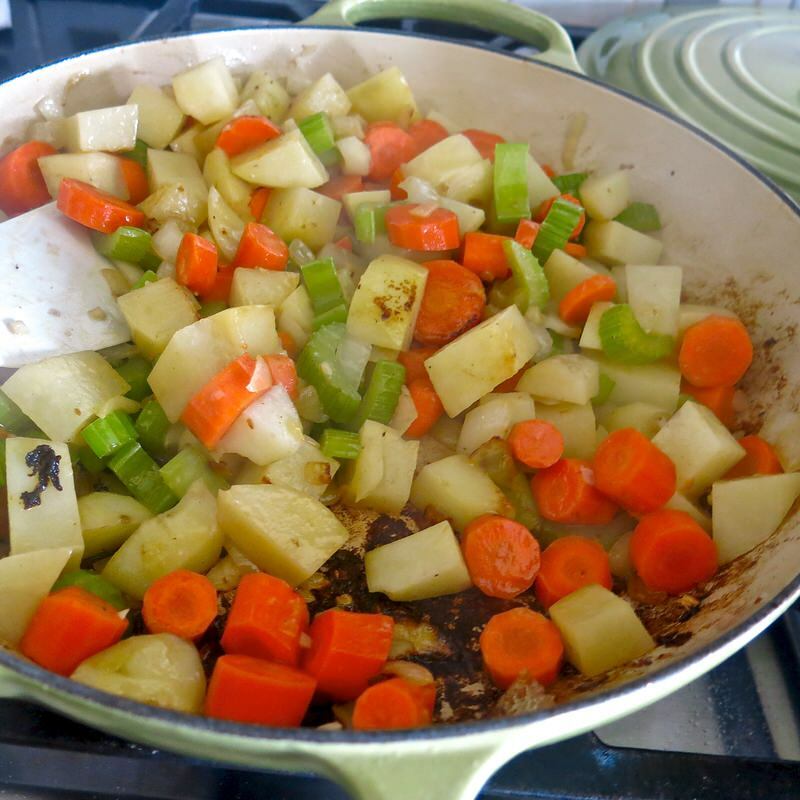 Logic told me to sauté the mirepoix (carrots, celery and onions), but leave the potatoes to add to the broth for cooking later. “No! No! No!” Laureen passionately pointed out. “All in with the vegetables, Valerie. 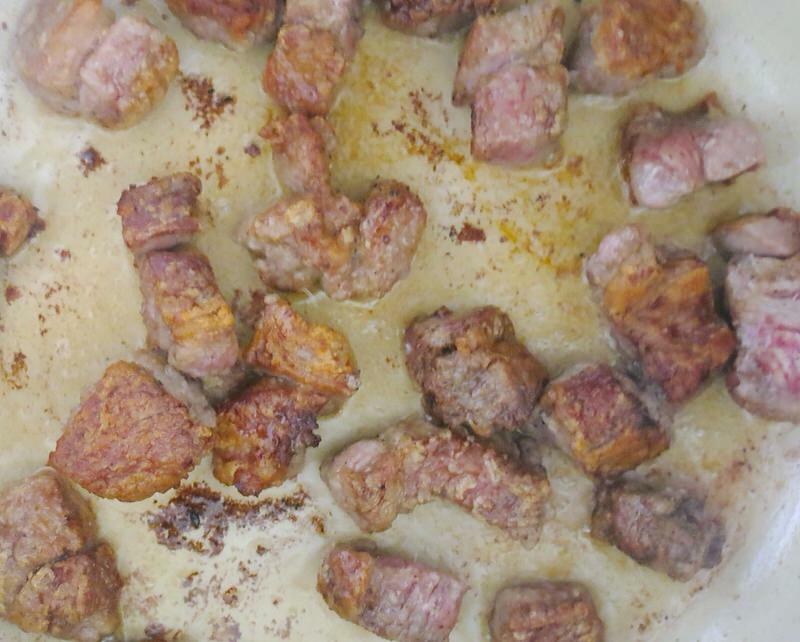 You want them all to caramelize. Even the potatoes.” If the recipe said that, and she wasn’t there, I still wouldn’t have done it. 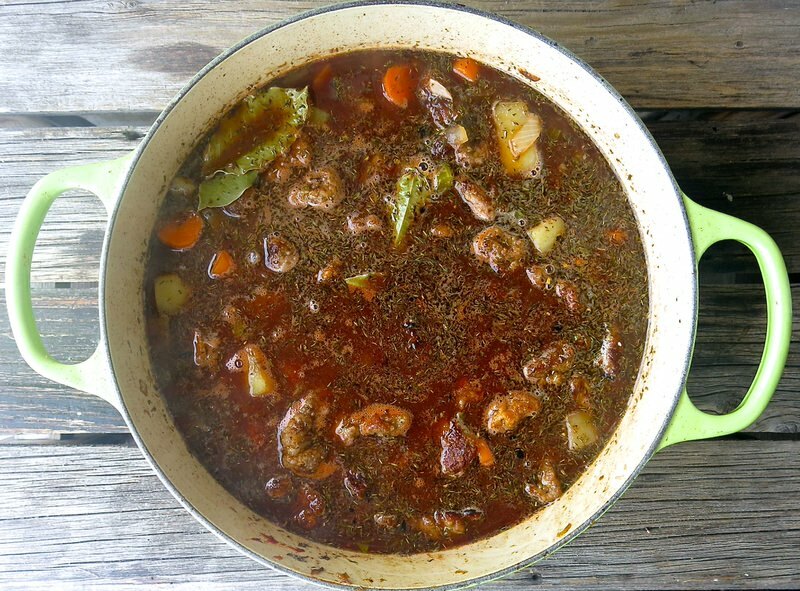 So, I am glad she was there as I did it, and the stew turned out great. Just as the meat was removed from the pan and set aside, so are the vegetables. 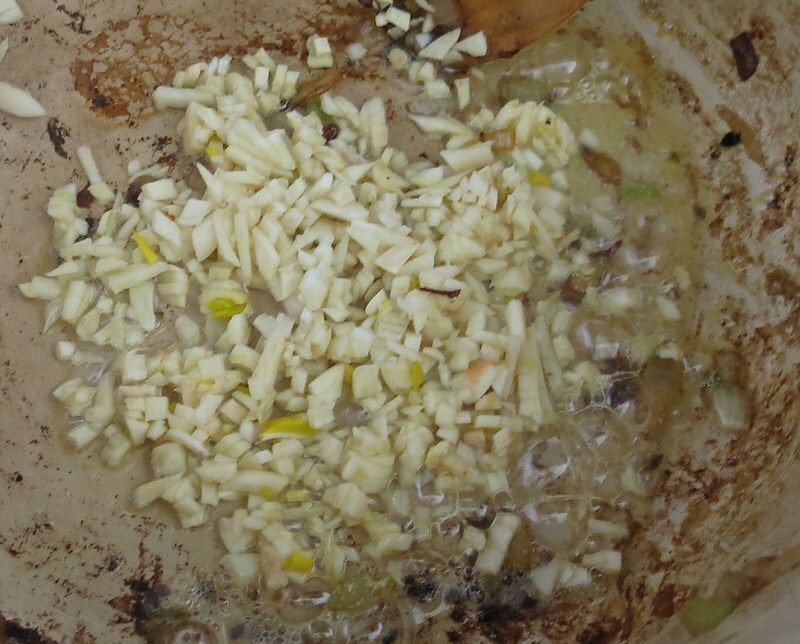 A healthy knob of butter goes into the pan with the garlic, just until fragrant, then the aroma of that and the wine intoxicate as it deglazes the pan. We were both wagging our little tails at the base excitement of the rich umami laden perfume. 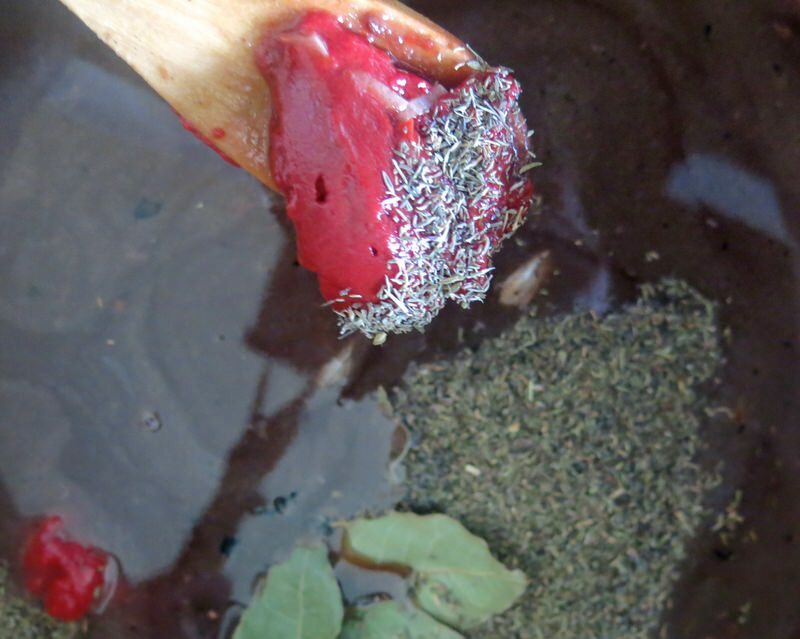 The Guinness was added, then the aromatics: the bay leaf, thyme, tomato paste and more. 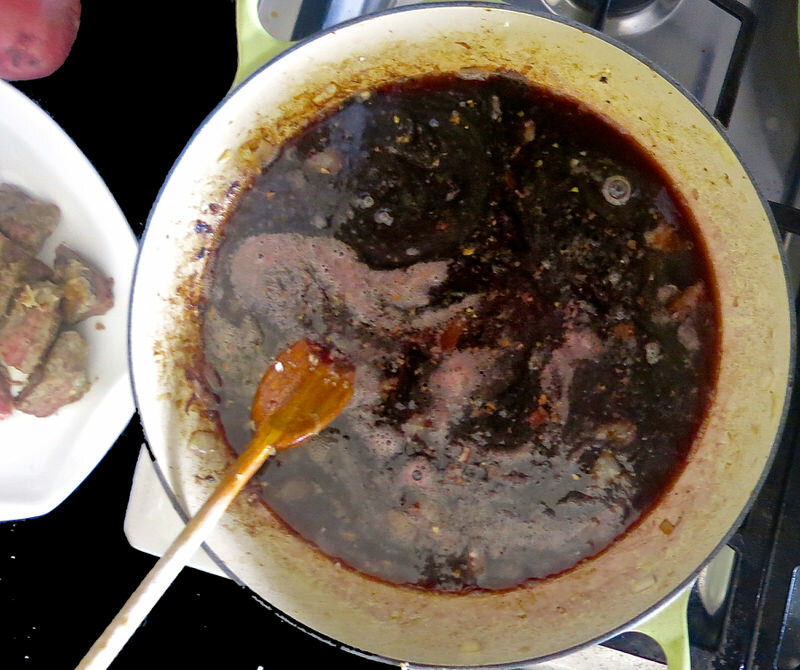 Finally, the stock was added and the sauce simmered for a good 10 minutes for the flavours to meld together. 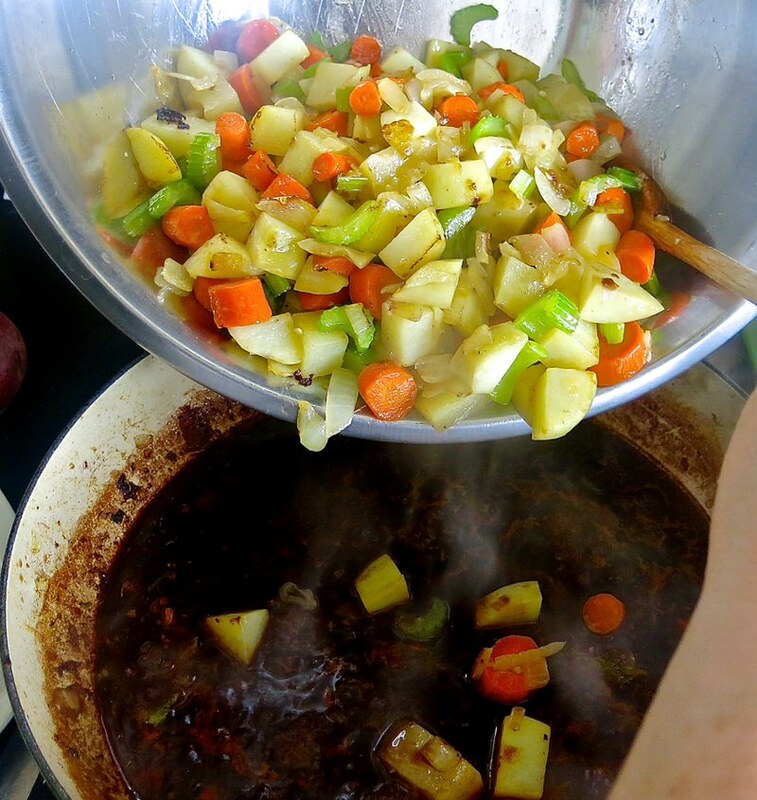 Reunion time: back in to the pot for the vegetables; back into the pot for the beef. Such a gorgeous display of colour, flavour and texture. Now, into the oven for an hour at the very minimum. Above, just out of the oven. Oh my. 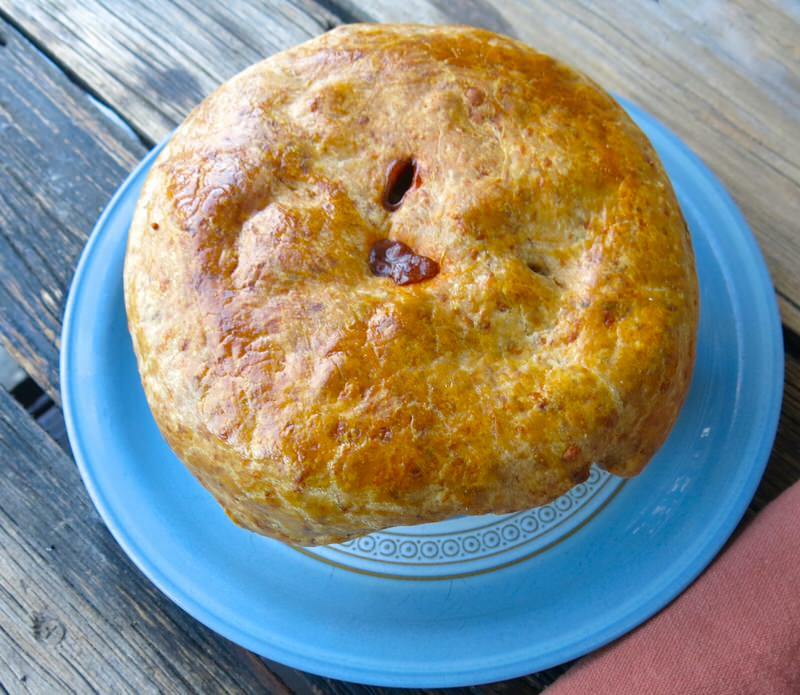 I spy, with my little eye, a rainbow of gorgeous colours in a thick lush gravy. 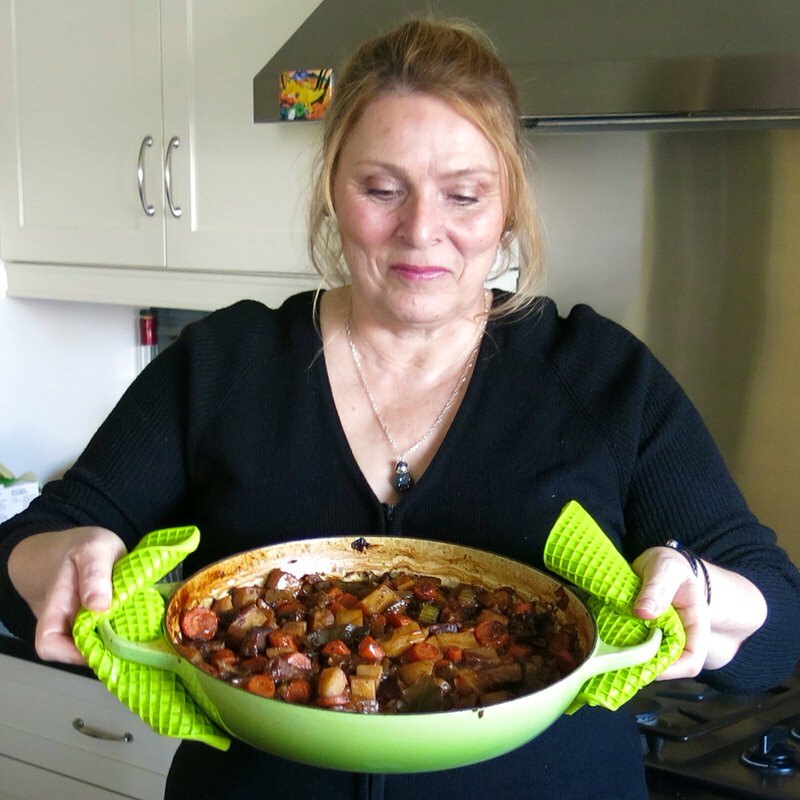 No thickening needed for Laureen’s stew. And mine? 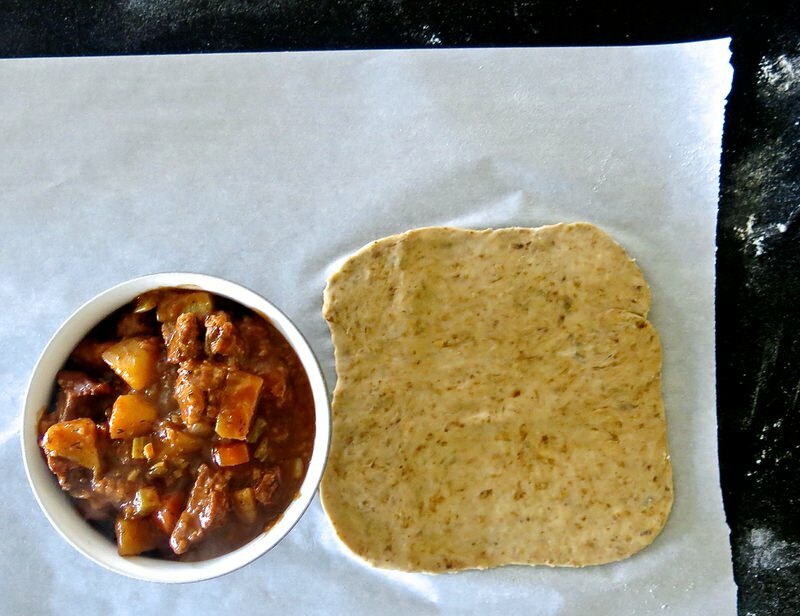 Above, left, before the hour in the oven and above, right, after an hour in the oven. Yup. Definitely needed to be thickened. I moved the stew into another pot first. 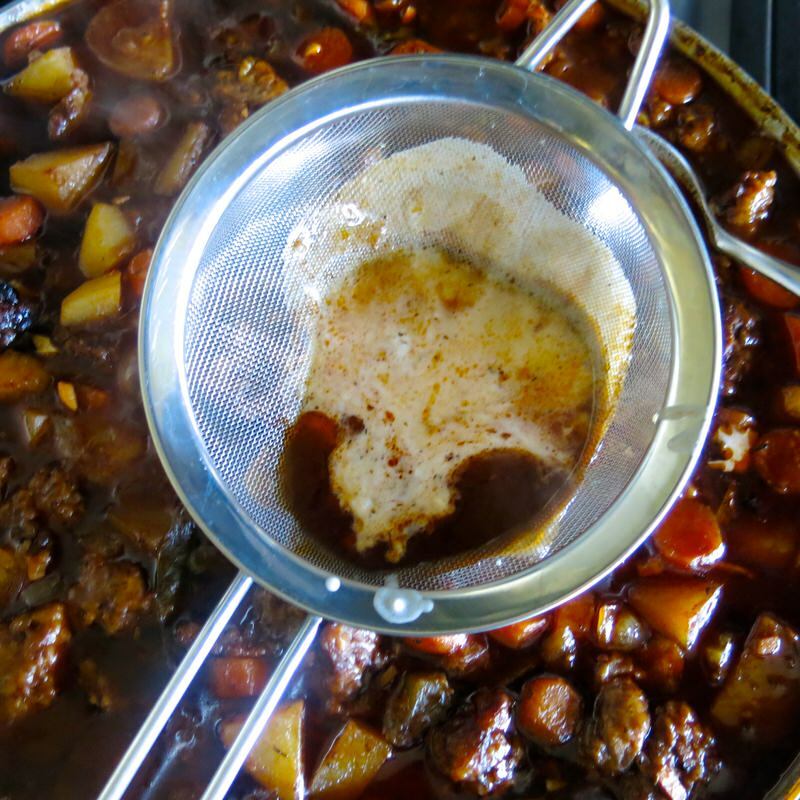 There were a few factors that affected the variance between the stews. I added 5 cups of broth and she added about 3. She was working with 1 pound of meat, and I was using 2. She was feeding only 2 people and I was feeding 4. She didn’t quite halve her batch, though. 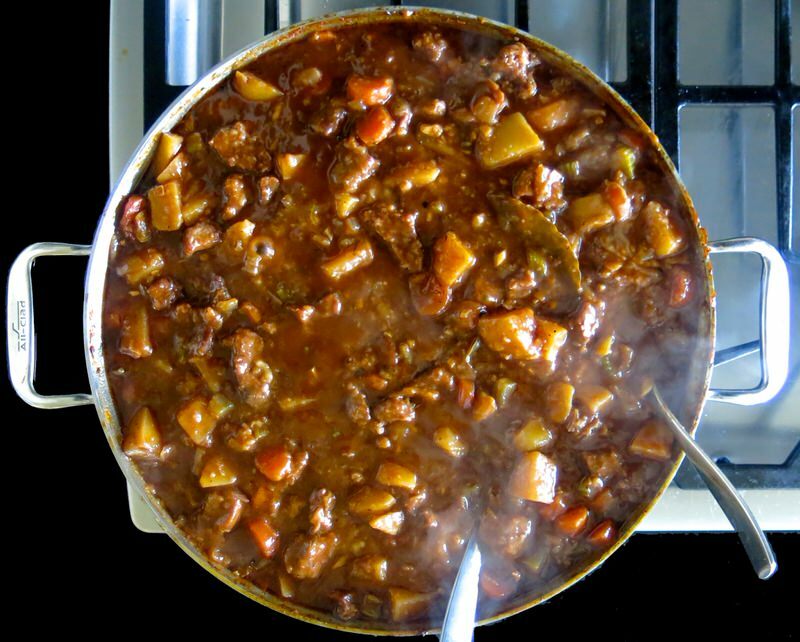 She made her stew like woman have made stews for centuries. 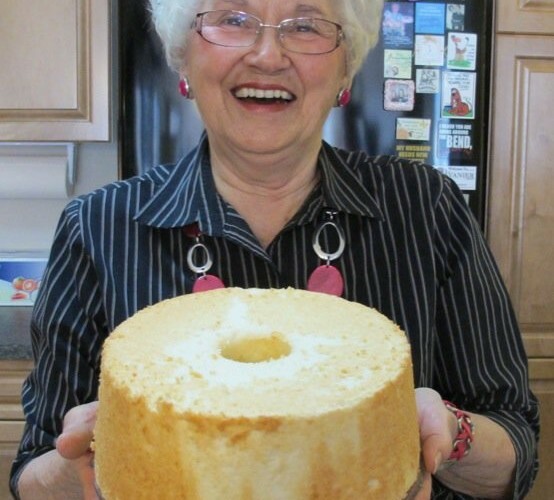 She used what she had and her recipe as a guide. I used her recipe as my Bible, and sinned a bit here and there. I will confess where, later. For now, it is time to thicken my sauce. 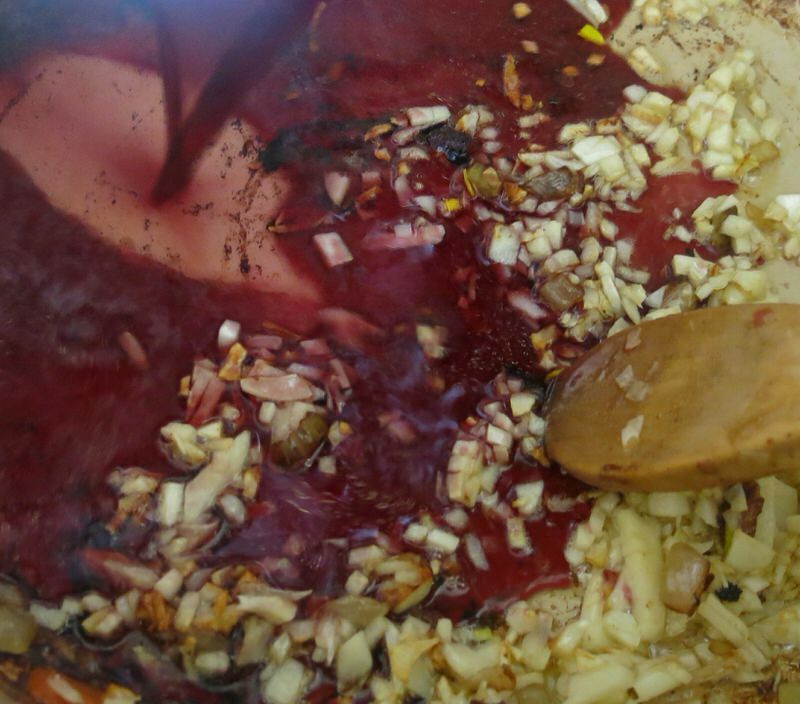 Let’s make gravy! 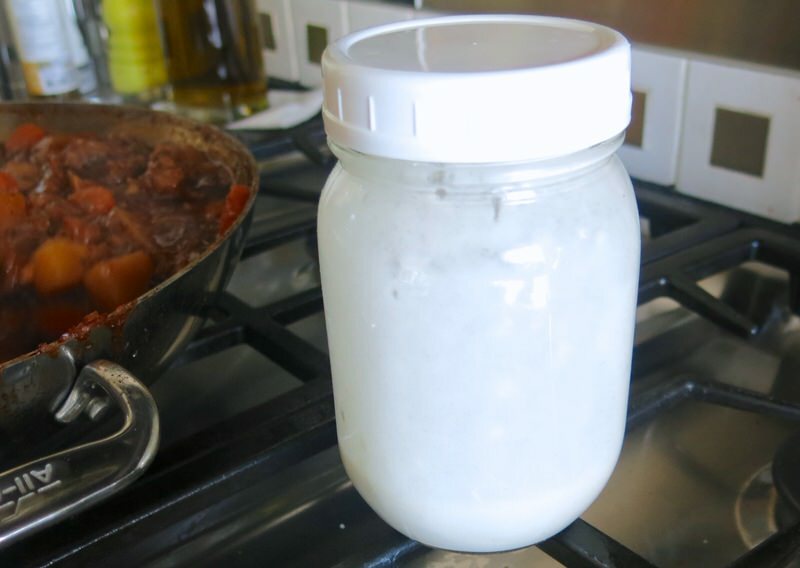 Above, left is my canning jar filled with equal amounts of flour and water, then shaken until smooth. 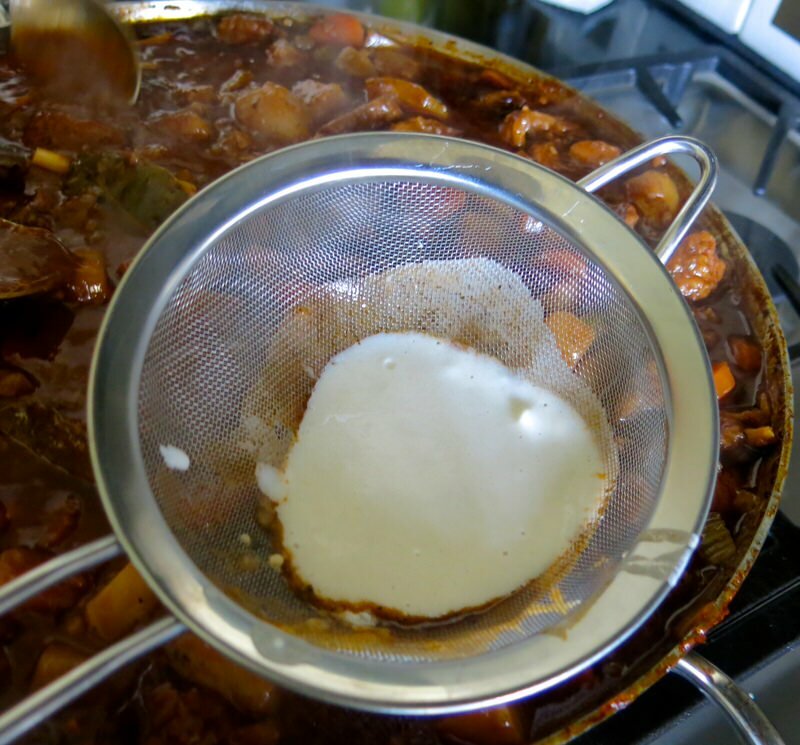 I use a sieve to add it to a stew to avoid lumps, as well. Simply pour the mixture into the sieve sitting right in the sauce, and stir the mixture into the sauce, then remove the sieve, widen the stire, and simmer about 5 minutes until the sauce thickens into a gravy. Taste, and season again with salt and freshly ground black pepper, as required. 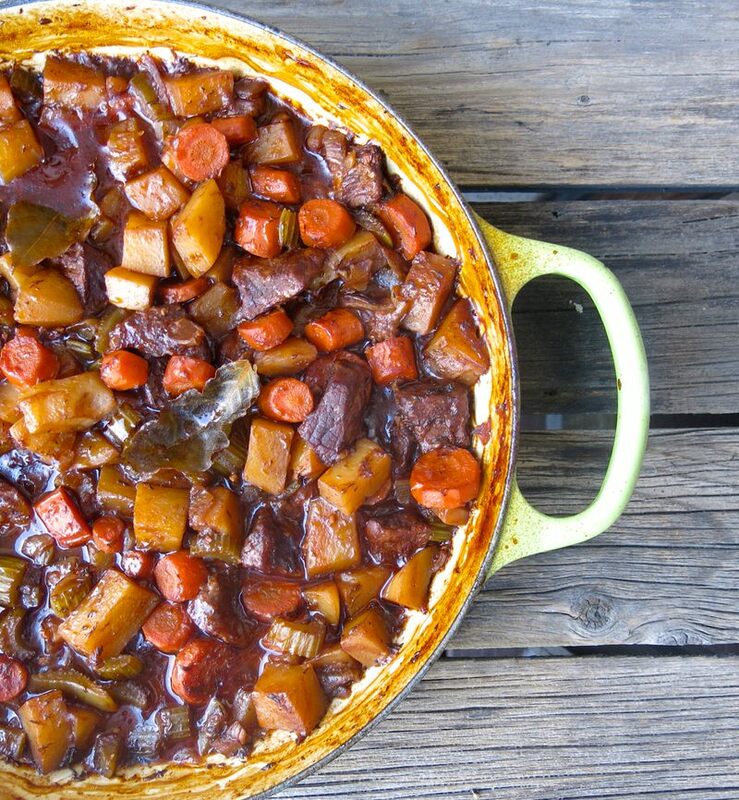 Now that’s a happy bowl of stew! I was so proud of us! 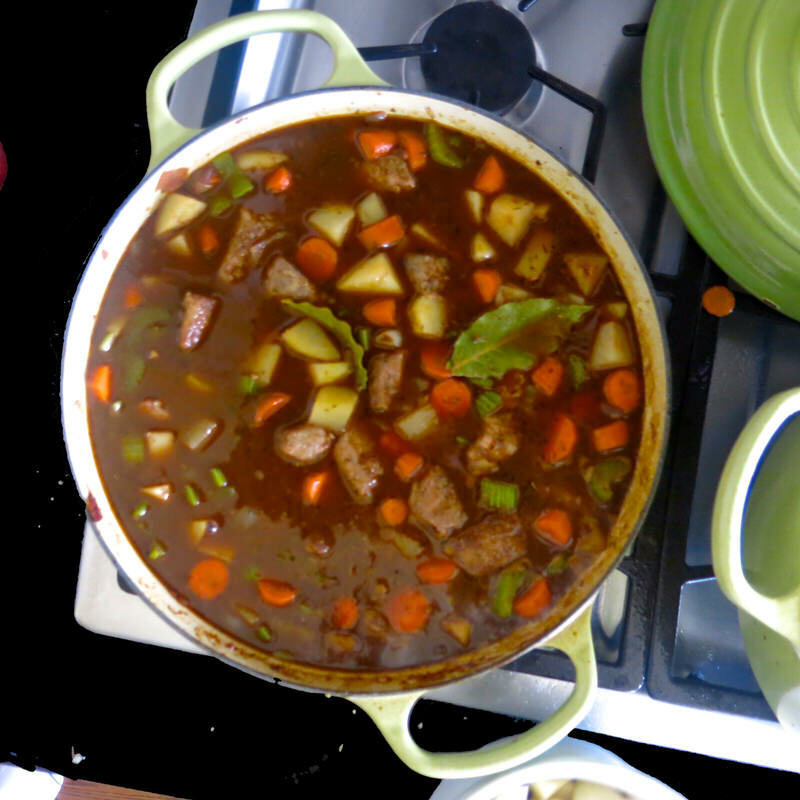 The stew was a delicious deeply complex bowl of beefy comfort. 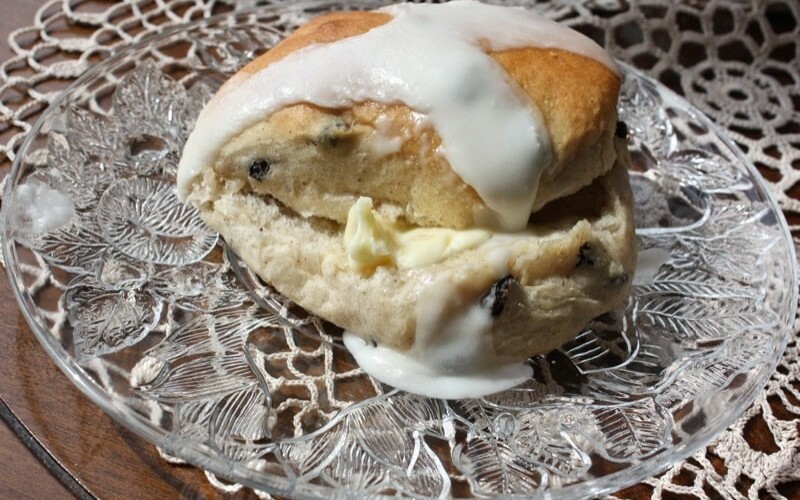 Seriously scrumptious. 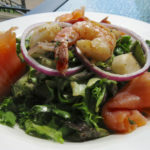 The wine and Guinness made great companions and added so much character to the backdrop of this dish. And the crust? So tasty! The flavour and texture were simply delicious. Not complex and delicious, but simply delicious. 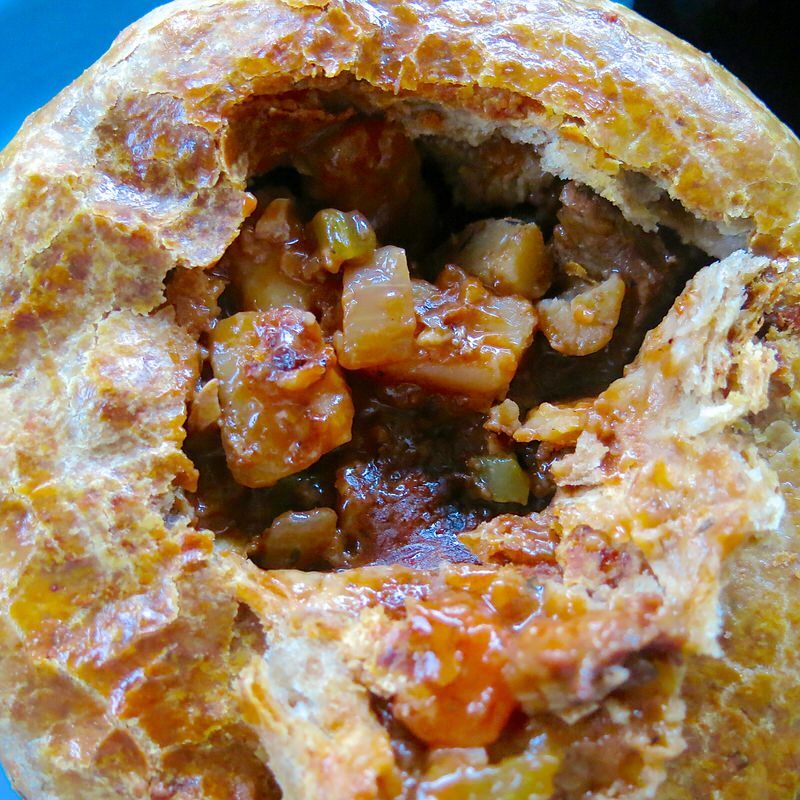 Cheesy and rich and crisp shards of pastry with a winter stew? Come on! 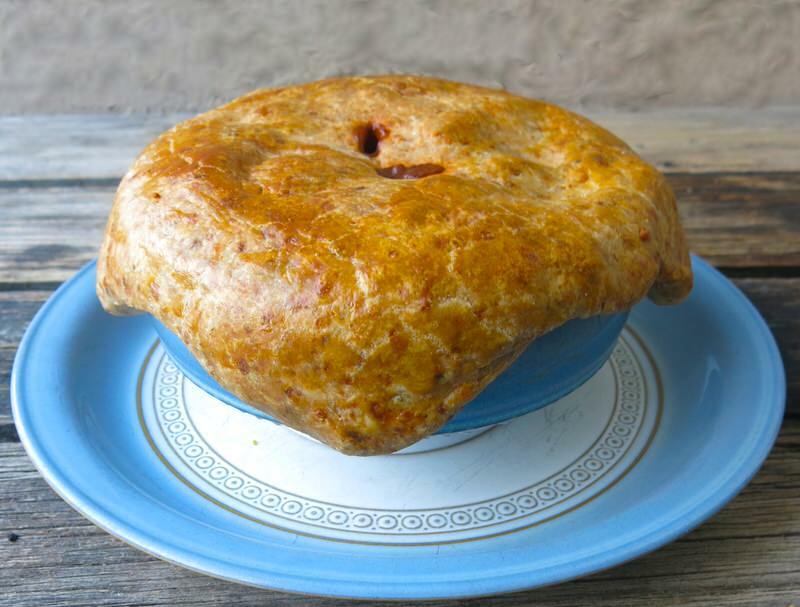 Though the recipe we used was the same, Laureen’s used less broth, and less vegetables and meat, albeit not proportionately. Also, her beef was from a store and mine was from my deep freeze as we bought a cow from our farmer. My beef was pink and grass fed and a very young almost veal kind of beef. 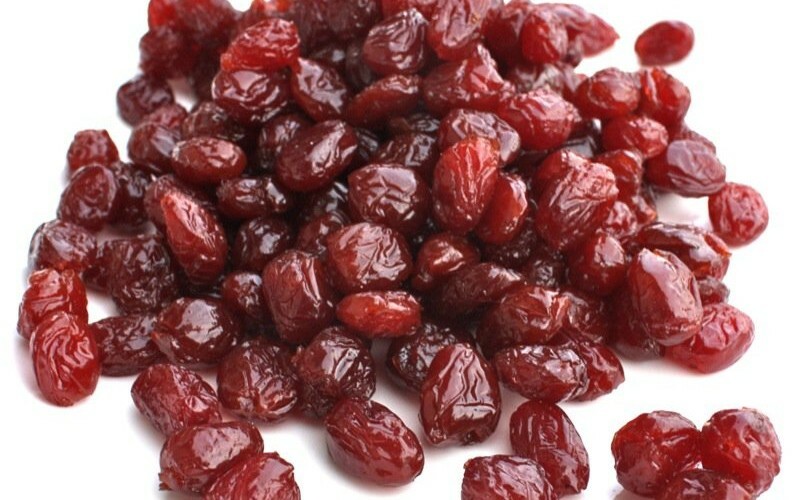 Hers was what most people use: deeply red, more fatty and with a bolder beefy taste. The other differences were that I used a little Vegeta and that she used one brand of tomato paste, while I used another. She chose the sweeter brand and I chose the more acidic. As well, I diced my celery into small pieces hoping they would almost disintegrate so my husband wouldn’t have to pick them out of his stew. They did. Hers is therefore prettier as little celery jewels are visible. Mine is on the left, above. Hers is on the right. Mine is redder and more savory; hers is browner and sweeter. Also, my sauce was very bitter when it went into the oven, but we forgot to simmer mine for the 10 minutes on the stovetop. I was happy she left me a sample to do a comparison. Tastings are my thing and I learn so much from them. Both were very similar, but there was a subtle difference. It was not a discernible difference. 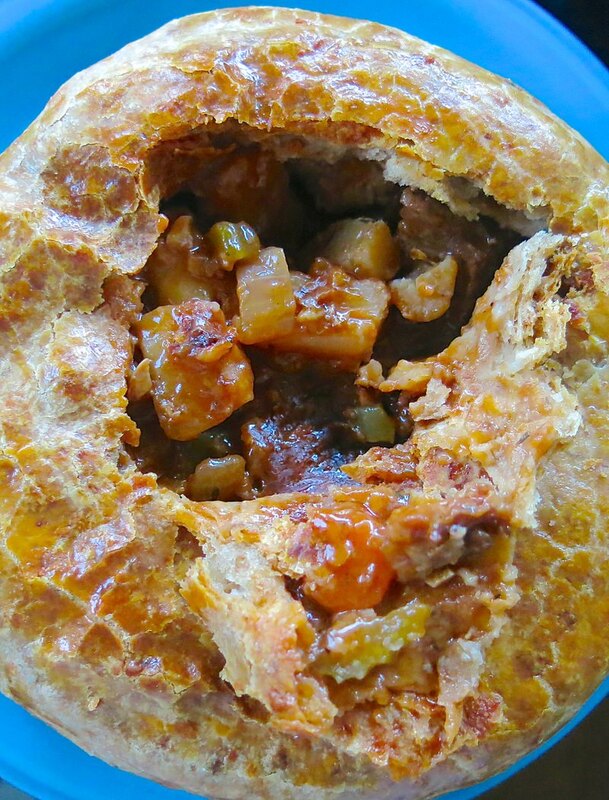 The crust took only minutes to make, but needed to rest an hour or overnight. Woops! Plan for that! Make it first! The recipe with step by step photos can be found here for Laureen’s Cheddar Stout Crust. 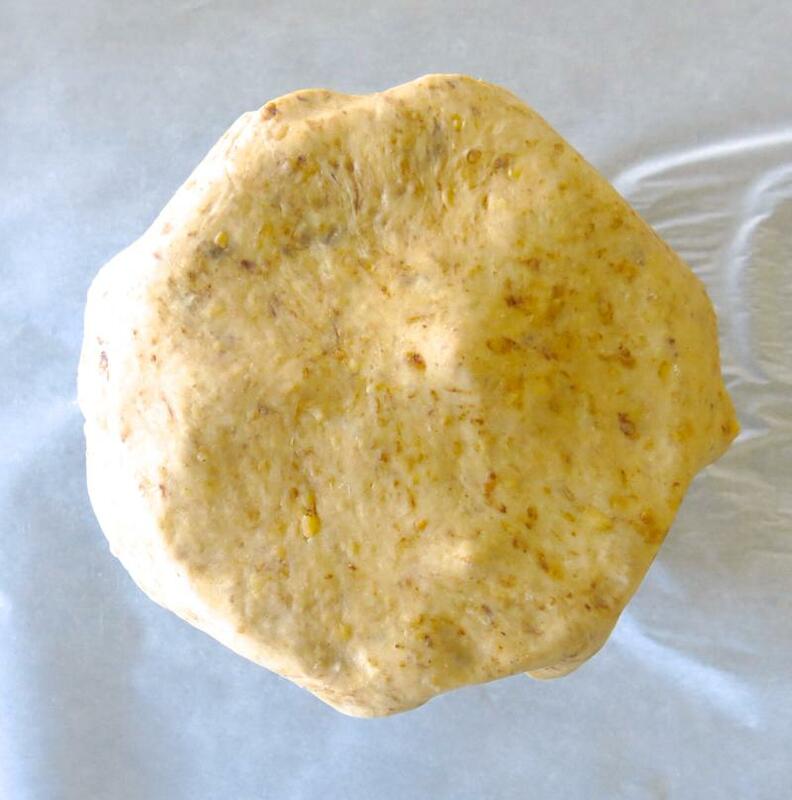 Just lay a rustically rolled patch of it over an oven proof bowl, brush with an egg wash, and bake for about 40 minutes until golden. It needs to rest a few minutes or someone will burn their tongue! So easy. Just delicious. What a great way to celebrate the onset of Spring, the Irish, my own heritage and my blossoming friendship with Laureen. she does some small things differently than I, yet gets a similar. if not the same result. I won’t go into detail, but that was empowering to witness. Lauren definitely knows how to cook and is very experienced and rightfully confident in the kitchen; she is absolutely (and hands down) a master of stews and has much more stew making experience than me. 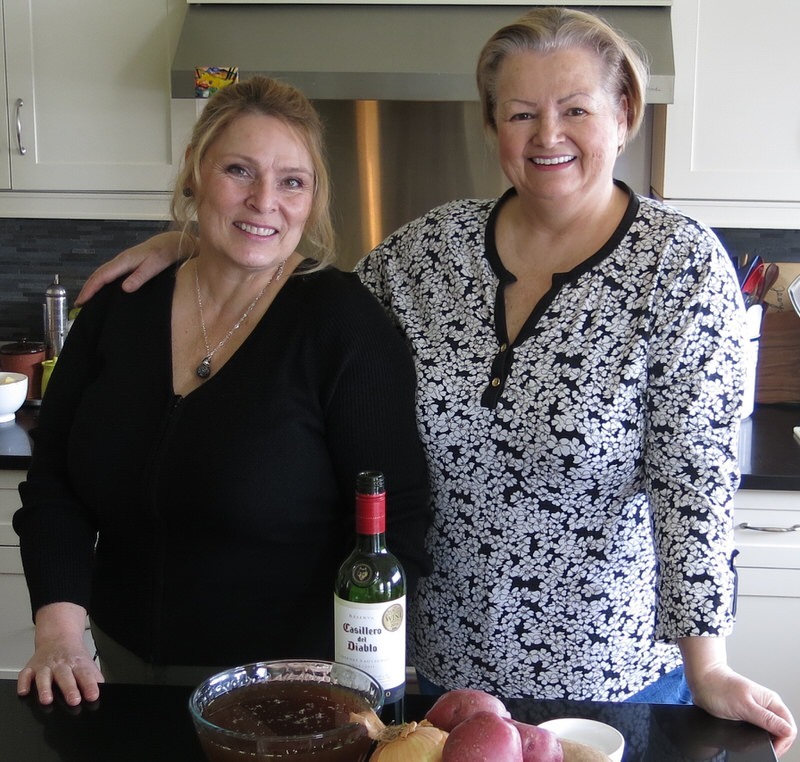 Lucky me to have had this day in my kitchen with Laureen. Thank YOU, Laureen King! 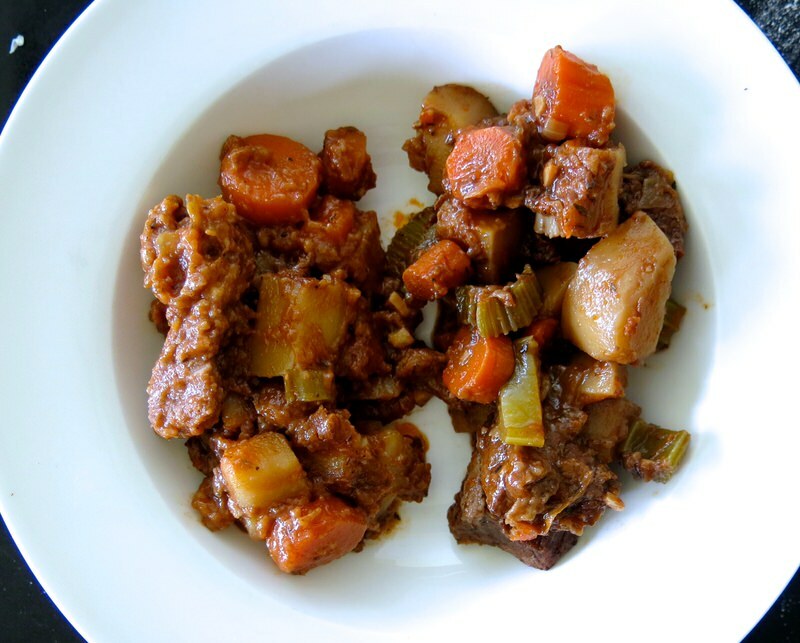 Canadian Irish Stew is classic modern day comfort. Cooking in the Kitchen with Laureen King is part of the ACF Cooking in the Kitchen with....Project 2017. 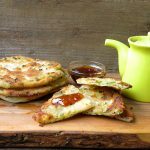 « Introducing Project 2017: Cooking in the Kitchen With….. YOU! What a great afternoon we had Valerie. 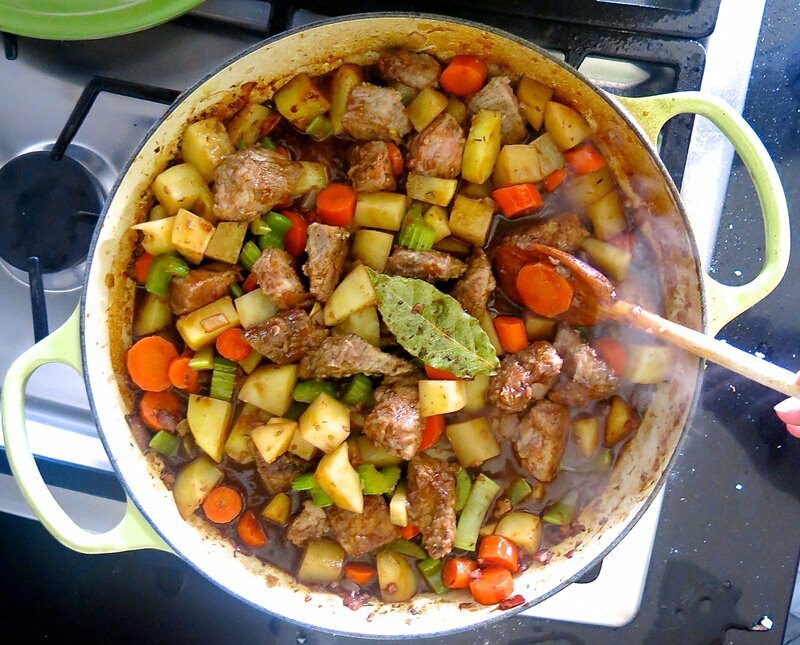 Your kitchen is amazing and we both got to have great stew for dinner! 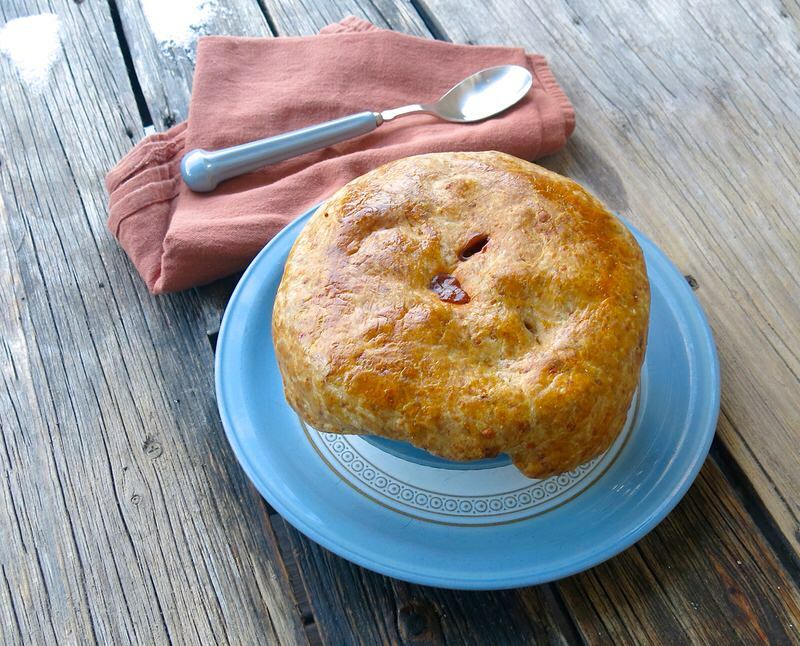 Yes – and I have 4 more lovely bowls draped with the most delectable crust frozen and at the ready for those lazy cold evenings when I don’t want to cook! 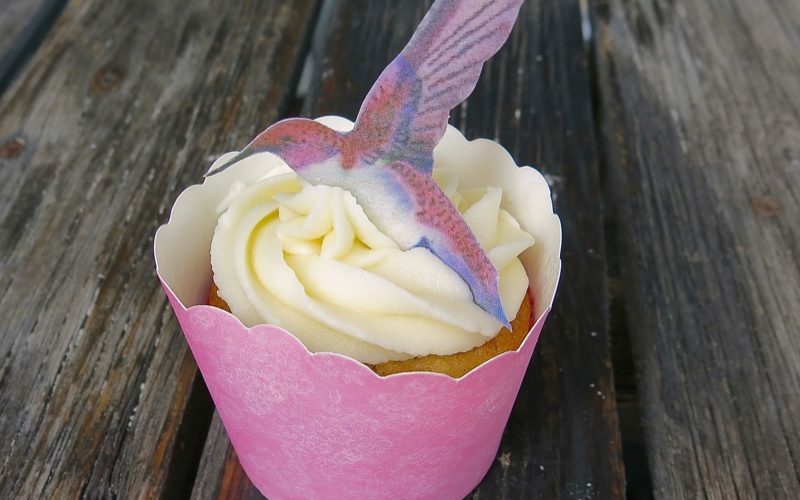 Really delicious and completely different that the one you two gals made last year. 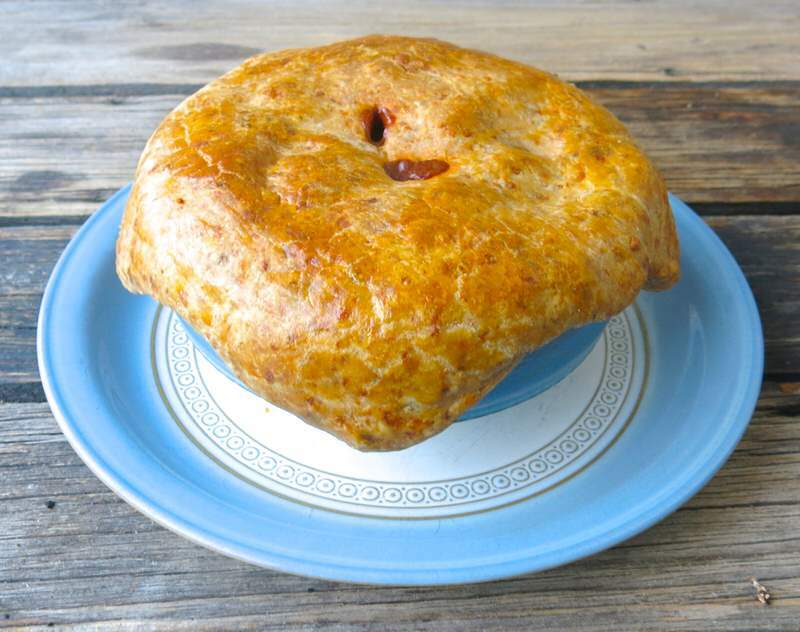 Well, even the same recipe you both used looked dramatically different between the 2 of you, but I can assure you, this recipe will turn out exactly like this if you follow the instructions. 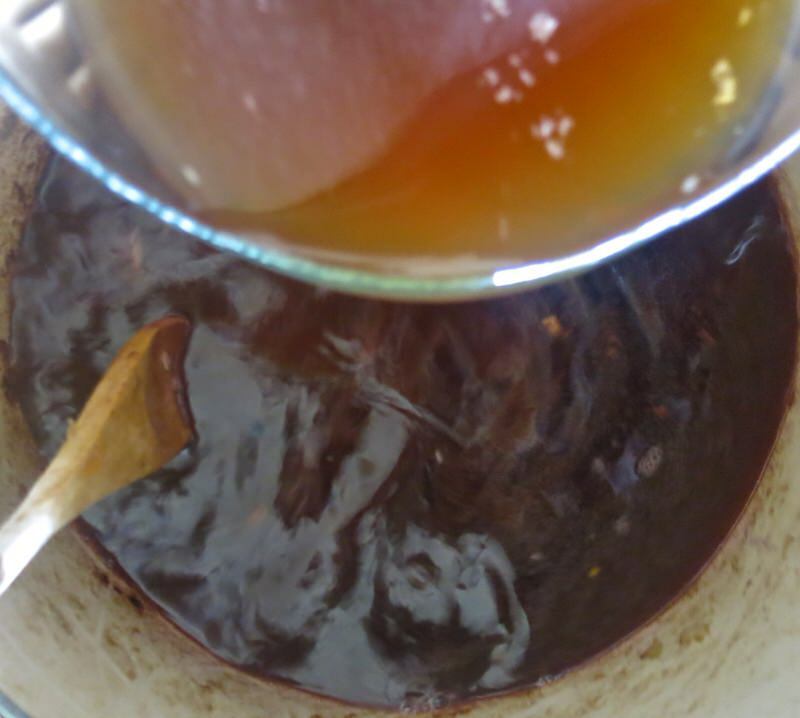 However, as you don’t drink wine or Guinness, I suggest you use a great beef stock and possibly some apple cider, instead.